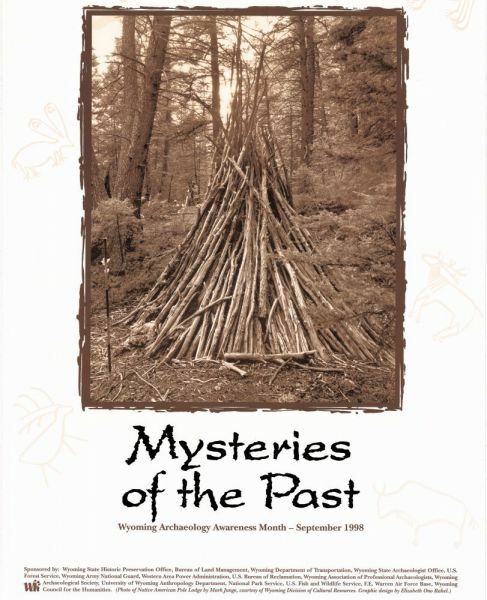 The solitary structure illustrated on the Wyoming Archaeology Awareness Month 1998 poster (click on image for a detailed view) was found on the western slopes of the Bighorn Mountains near Tensleep. This and other similar structures, often termed conical, timber, or war lodges, remain a mystery to students of the past. These rare features occur in mountainous areas and could have been used by the prehistoric people of Wyoming for thousands of years. Because they are made of wood, which decays rapidly, the ones we know about are only a few hundred years old at most. This has been verified by the use of dendrochronology or tree-ring dating. Several dozen long, thin wooden poles surround a central support post, giving this lodge a tipi-like appearance. Smaller logs and pieces of wood were inlaid between the larger timbers to form a sturdy shelter. No one shape or size characterizes all timber lodges: similar log structures were built by piling juniper trunks to form a shelter or by leaning poles against a cliff face. The use of timber lodges was probably not restricted to a particular tribal group, and little is understood about their specific uses. These lodges contain very few artifacts. Because so little material culture remains with these features, archaeologists have speculated that they may represent temporary camp sites. The term "war lodge" implies use by Native American war parties, however, this has not been verified. The secluded settings of many timber lodges hint at spiritual associations and significance for these structures.